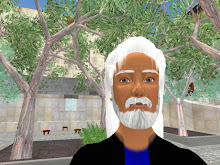 What project will Danton Sideways develop in Second Life? I thought I might go into business, or get involved in CDS politics. But a bit of soul searching has revealed that the Real Danton is above all interested in putting into practice Ivan Illich's theory of convivial tools. "Tools! My God, I should have realized long ago that they picked up this rhetoric from Stewart Brand *slaps head* -- the old Whole Earth Catalogue had tools for living, as they called it, and we used to spend hours poring over its pages, reading about old-fashioned ice picks that were actually the perfect thing to use on stubborn weeds in your garden - or whatever. It was even more dorky than the LL Bean Catalogue. It was always about drying and grinding millet seeds and making millet loafs (whenever I think of that era of the 1960s and all that Whole Earth stuff, I think of millet loafs, and how goddamn hard they were to eat, with like 92 different grains and raw vegetables in them, and how we used to force them down anyway; in fact, what they did was make food taste like a tool...)"
Good old Prok – always ready to pop your balloon for you. Prokofy's role, as I see it, is to challenge our habitual ways of thinking, to act as a gadfly to force us to reflect more deeply. Prokofy is the sort of opponent who, if properly listened to, teaches you more than your friends ever will. Because of course the Whole Earth Catalog was mother's milk to Danton Sideways. The Whole Earth Catalog came first, and Ivan Illich only became important to me later, in the nineteen-eighties, when I learned how Illich's theory of convivial tools had influenced personal computer pioneer Lee Felsenstein. Why do I now refer to Ivan Illich more than to Stewart Brand? One reason is that Illich provides a specific theory about tools, while Brand has always focused on practice (albeit a practice of spreading new theories). But there are also basic differences between the approach theorized by Illich, and the approach put into practice by Brand. I will try to show that these two approaches are complementary. The key difference is that Brandian practice is implicitly elitist, while Illichian theory is explicitly anti-elitist. The Brandian approach has always relied on a new Promethean elite, supposedly wiser than the traditional unenlightened elite, which is to bring "alternative" tools to the citizen. Thus the Whole Earth Catalog was produced by a team of specialists (and even those who contributed simply by writing letters to the editor formed a sort of elite), the CoEvolution Quarterly presented articles written by experts, the participants at the first Hackers Conference were hand-picked, and the Global Business Network assembles a stellar cast. Illich, on the contrary, persistently criticized professional elites. The recurring theme throughout his books is that the professionalization of knowledge tends to disempower the average citizen. In Deschooling Society he demonstrates how professional teachers can prevent learning, in Tools for Conviviality he demonstrates how professional technologists can prevent community appropriation of tools, and in Medical Nemesis he demonstrates how professional doctors can prevent self-healing. The basic thrust of Illich's thought is to encourage individuals and communities to take back the control of knowledge which has been monopolized by professionals. Thus, with respect to tools, Illich's proposed solution is community appropriation of technology. Stewart Brand has of course always been concerned with community. But Brand tends to see the tools coming to the community from the outside. The right tools are supposed to empower the citizen, without there being a need for citizens themselves to be involved in tool development. For Illich, the community only really appropriates the tool when the community itself participates in developing the tool. A case study of the Illichian model of community tool development is found in the history of the personal computer. In the early nineteen-seventies Lee Felsenstein was working in San Francisco as chief engineer for the non-profit organisation Resource One, which had obtained the donation of an obsolete XDS 940 time-sharing computer. At a time when the Internet was no more than a research network linking a handful of campuses, Resource One set up a few public terminals at community gathering places around the SF Bay Area, to serve as electronic bulletin boards. In 1974 they installed a showcase connection at the Whole Earth Access store on Shattuck Avenue, using a fancy Hazeltine 1500 CRT terminal, which they leased with a service contract. One day the service technician working on it dropped the circuit board for the keyboard, breaking the ceramic pack on one of the chips. That experience started Felsenstein thinking about how to make such a system survive in a public access environment. Felsenstein had just read Ivan Illich’s book "Tools for Conviviality," and was impressed by Illich's description of how radios were repaired in the jungles of Central America. The radio technology was sufficiently accessible to peasant users and brought out their inherent tendencies to learn. If you tried to fool with a radio, the tube might overheat, but it would survive and give you some warning that you had done something wrong. The radio could thus be used in the jungle environment because it "grew up" a cohort of people around it who knew how to maintain it. To transpose such a model to computers, which require perfect reliability at every clock cycle, was particularly challenging. Felsenstein nonetheless convened a discussion group around the concept of a convivial computer, on the hypothesis that a new type of computer could only survive if it grew a computer club around itself. Among the subjects discussed by the small group (which soon fizzled out) was Don Lancaster's article in Radio Electronics magazine, telling how to build a "TV Typewriter," which did nothing more than print characters on a home TV screen. Felsenstein was interested in this possibility of constructing a little box, for about a hundred dollars worth of parts, which you could connect to a TV set to make a rudimentary terminal. He worked on developing an improved version that used random access memory chips. Felsenstein realised that if you installed the random access memory in a simple computer, you could then use that same memory to run the terminal. He therefore defined a terminal that used a three card set: a memory card, a card to put data into the memory, and a card to get information out of the memory and put it to the screen. To connect the three cards he defined a 44-pin bus structure that used cheap Vector connectors. He has suggested that this was the genesis of the architecture of the personal computer. But to carry our story forward, a few months later, in January 1975, the MITS Altair 8800 hobby kit was advertised in Popular Electronics magazine. That advertisement catalyzed a meeting of computer enthusiasts grouped around the People’s Computer Center in Menlo Park. The meeting was attended by Lee Felsenstein, Steve Wozniak and many others who went on to play key roles in the development of the personal computer. The Altair is considered to have been the first "microcomputer," but it was in fact little more than a microcomputer chip inside a box. Those at the meeting soon realized that they, as a group, probably possessed more computer knowledge than the team that had thrown together the Altair. This group, which later called itself the Homebrew Computer Club, met regularly over the next year or so to carry on informal discussions of how to construct personal computing devices, in a collegial atmosphere of shared enthusiasm, rather than commercial interest. The very name suggests the extent to which this group embodied Felsenstein's original Illichian idea of a "computer club" to "grow up" a new type of computer – which is precisely what the Homebrew group did. The Homebrew Computer Club was in fact a cross between the Brandian Promethean approach and the Illichian participatory approach, since it brought together an elite, but working on a participatory model. This is one way that the two approaches can be complementary. Another way is for a Promethean elite to bring new tools to a community, and for the community to then appropriate the tools and participate in their further development. This is essentially how things happen with free and open source software. Highly specialised programmers develop a software package, and then turn the source code over to a community of users, who participate in further development by finding bugs and adding new functionalities. Going a step further, when the Promethean elite deliberately sets out to design tools that can be easily modified and appropriated by the users, the two approaches fuse together into a new paradigm. Another of Illich's key contributions is his use of the word "tool" to refer to all sorts of human constructs, rather than just physical instruments. The Whole Earth Catalog had already used the word "tool" in a very wide sense – more than half of the items in the Catalog were in fact books. But Illich makes this extension of meaning explicit, building on a tradition exemplified by the French philosopher Jacques Ellul, who in the early nineteen-fifties used the word "technique" to include all of the various administrative methods used by modern state bureaucracies. Illich for example specifically calls legal mechanisms "tools." Certain other thinkers even refer to ideas as a type of tools: see for example Daniel Dennett's paper on Making Tools for Thinking. "The tool thing is loosely based on that old idea of 'give a man a fish, and you have fed him for one day; teach a man to fish, and you have fed him for a lifetime'. The problem with this facile adage of Western do-goodism is that people in civil war in Africa have a different problem. My God, they know how to fish, if they even have fish (a lot of them are in the desert). The problem is their kleptocratic governments steal their poles or poison the waters or chase them off their land with fratricidal wars. A man in Darfur needs a fish, not a pole, and somebody should attend to the larger problem of all the well-poisoning and cattle-slaughtering and compensate the villages for that destruction." Prokofy's point is conclusive if by tools we mean only physical instruments such as fishing poles. The first need of poor people in many countries is not for material tools, but to be liberated from the corruption and repression of their own governments. But the question is how to achieve that. The international community can play a role, on the Promethean model of bringing help from without. But it remains critically important for such communities to develop their own internal capacity to struggle for democracy. Thus the pertinence of the Illichian model of development by the community of its own "tools" in the largest sense, including the types of associations, organisations and thought-models that can enhance empowerment in the local context. When you mention developing countries and tools, this makes me think of that $100-laptop. It will be very interesting to see how that works out. Also, when you mention democracy and SL, that makes me think of the CDS of course. What strikes me about the CDS as an organized community is its tendency to forget. That's not only due to its small size but also because the wheels of the community only turn when people have spare time to spend on it. In that way, things that need to get done are forgotten, the meaning of rules/laws are forgotten, and little by little even the founding philosophy may be lost out of sight. I haven't thought about it yet, what consequences this will or could have. But it's kinda interesting, don't you think? As a though experiment, it would also be interesting to consider how a 'firm class of experts' (like the extremely short-lived CDS Judiciary branch) -- what effect that would have on the CDS's development as a community or organization. Sleazy – I'm new here, and hope to learn more about CDS history. As I understand, a group of legally-oriented residents within CDS tried to establish a judiciary branch for this small democracy. However, their proposals were deemed overly-complicated by the CDS majority. Some members of the legally-oriented group thus left to devote their attention to the project called Metaverse Republic. This story suggests that CDS is generally following a democratic process in selecting and developing the legal mechanisms that the majority of residents feel are appropriate. It would thus be an example of the Illichian principle of development by a community of its own "tools," if we can consider legal mechanisms to be tools. > Illich, on the contrary, persistently criticized professional elites. Thanks for posting this paragraph! As a Ph.D. student on the job market, I wonder a lot about how I can use my research to benefit the general public and not just academic specialists. I don't really have any interest in the academic field as an academic field; I'm more interested in reaching a lay audience. This is extremely long, and I don't have time to read it through now. I don't like Ivan Illich. He is a typical Marxist, frankly, replete with third-worldist anecdotes. Too many people have read Illich and destroyed the educational system *for real*. Danton, you must not have children who have suffered under such city school districts to be so pie-eyed about Illich. There's nothing wrong with experts, and they aren't elitist, per se. They're just experts. Give me a set of named, referenced experts, whose pedigree I can see, and lineage, rather than anonymous post deleters on wikis anyway! Oh, I'm a big critic for the demand to be credentialed. I think it's great if non-experts spring up. But there's no need to destroy systems of experts *too*. There can be a balance. I think of the Whole Earth Catalogue as something that tried to put a lot of cultural ideas about living with the earth, organic foods, etc. out there in as mass a broadcast as they could manage in that era before the Internet. I don't think of it as elitist at all, although of course the counterculture was essentially the product of spoiled rich kids with trust funds and time on their hands who didn't go in the army or work for a living, but just lived in communes while their parents wired them funds. It was a counterculture of elites against a culture of elites, and that's ok, because such clashes do make cracks in the facade from which everyone can benefit. Illich is generally classified as a catholic anarchist, although he was influenced by the Marxist rhetoric in vogue in Latin America in the sixties. There is much in his outlook and style that already seemed out-of-date by the late seventies, when he more or less disappeared from the public eye. But if you can get past the archaic tonality, his texts reveal an idiosyncratic visionary, a prophet of much that has come to pass in the Internet revolution. I have three daughters who are suffering in the French high school system. Their life is made hell by the inflation of educational requirements, with students competing ever more ferociously to secure their future credentials. This is exactly the type of excessive "schooling" that Illich criticised. I agree with you about experts and non-experts. I think credentialed experts are absolutely necessary, and at the same time I want to see non-experts be able to do more. And it does seem unfair to use the term "elitist" with respect to the generous and humble Stewart Brand. But there is something Promethean in the Brandian approach, which prevents one from appropriating it and carrying it further. Whereas the Illichian theory of tool development by and for a community of users can be taken up and put into immediate practice by anyone who manages to gather two or three friends for a discussion group.